I am so incredibly happy that we found ForeverFiances. We went with the "Our Tree" collection on plantable paper, and we could not have been more impressed with not only how they turned out, but the customer service we received from ForeverFiances. There was quick, informative communication every step of the way -- from before placing the order, to working with the graphic designer, to when the order actually shipped. I was speechless when I opened the package -- they were better than I could have imagined. I wasn't sure how I would feel about the plastic envelopes, but I ended up loving them. We just sent out our invitations a few weeks ago and the response has been overwhelming. I've been flooded with texts and emails from friends and family complimenting the invitations. Thank you so much, ForeverFiances! 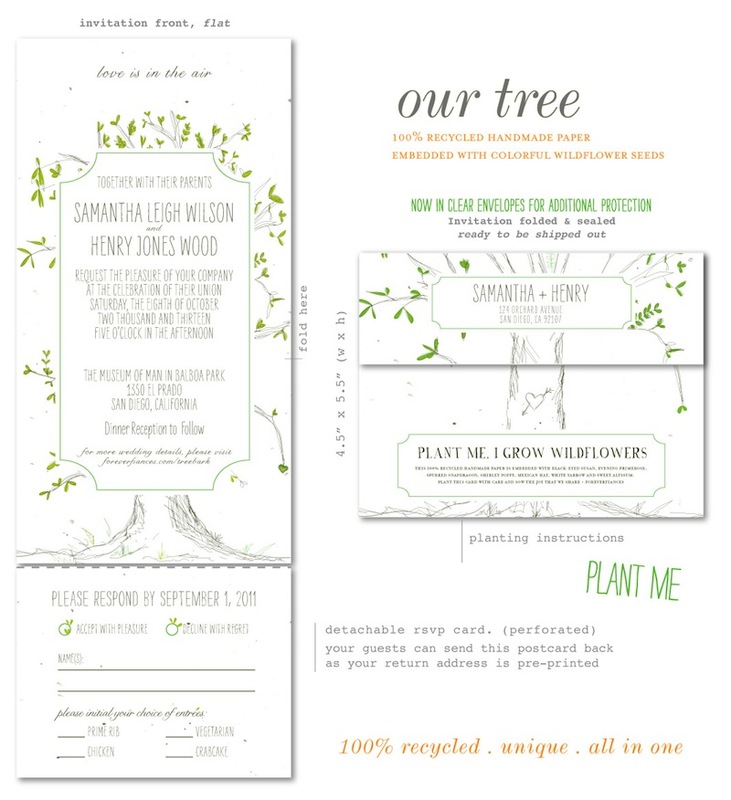 I wanted something different and eco-friendly for our wedding invitations. I did not like the idea of sending invites with a ton of paper that would just be thrown in the garbage. FF prints on beautiful plantable paper and will customize the wording for you. They were always easy to contact and quick with their responses. The 3 proofs given made me feel very comfortable during the ordering process. Everything from the colors, fonts and paper to the wonderful way they were packaged when we received them, FF did a great job. I have already recommended them to a friend. So easy to customize the colors and wording! (even though we ended up with the original model :)- The proofs were a huge help to make sure that everything looked the way I wanted! The transparent envelopes look great and protect the invites. Everyone has been telling us how beautiful and unique they are :) thanks so much!!!!!! Oh my gosh! We love love our invitations. Wonderful product, customer service, timeliness... Wonderful. Many thanks!